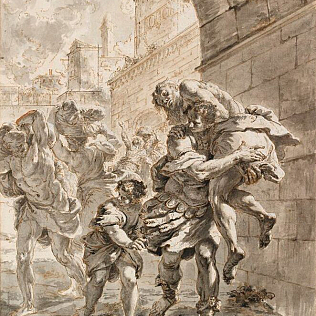 A new exhibition at the Uffizi Gallery, in rooms of the Department of Drawings and Prints. The exhibition is titled \"The Triumph of Colour over Line. Venetian Drawings from the Ashmolean Museum and the Uffizi\". It brings together 48 drawings of the two collections. The event is the natural continuation of the English one. During the Sixteenth century, the drawing style of the Florentine tradition was placed in opposition - especially from Vasari - venetian graphic production. However, we know that the judgment of Vasari was aimed at supporting the Florentine Academy primacy. The exhibition aims to show how the idea of the design of the Venetian artists - between the fifteenth and the beginning of the eighteenth century - it was not inferior than that of the Tuscans. There are works by Carpaccio, Jacopo Bassano, Giambattista Tiepolo, Canaletto, Sebastiano Ricci, Francesco Guardi. The exhibition will be open from October 25, 2016 al 15 January 2017.